The Pew Hispanic Center has a very interesting new report on the Latino vote in 2010. Their chart shows that the number who have voted in midterm elections has steadily increased, to 6.6 million in the most recent election. This was in 2010 some 6.9 percent of all voters, up 1.1 percent since the last midterm election. 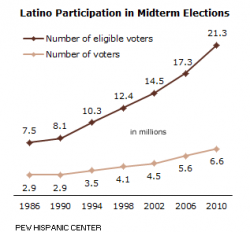 Rapid population growth has helped fuel Latinos’ increasing electoral participation. According to the Census Bureau, 50.5 million Hispanics were counted by the 2010 Census, up from 35.3 million in 2000. Over the same decade, the number of Latino eligible voters—adults who are U.S. citizens—also increased, from 13.2 million in 2000 to 21.3 million in 2010. In 2010, 16.3% of the nation’s population was Latino, but only 10.1% of eligible voters and fewer than 7% of voters were Latino. This gap is driven by two demographic factors—youth and non-citizenship. Nearly half (49.3%) of Cuban origin Latinos voted in 2010 compared with 29.6% of Puerto Rican origin Latinos and 28.7% of Mexican origin Latinos. The Pew Hispanic Center has been doing some useful research reports for both researchers and teachers working on Latino issues, including those researching the political and other impacts of this growing Latino vote. I have seen very little, speculative or data-driven, research examining the likely political and other impact of this growing voter group over the next few decades. 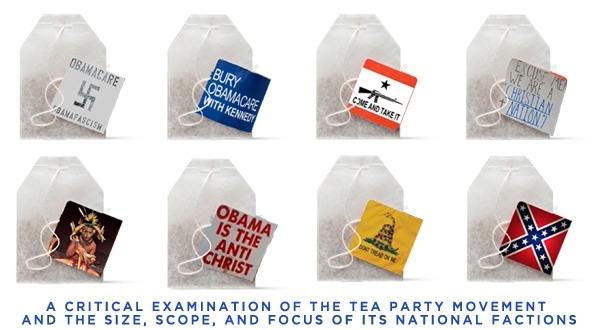 It certainly played a significant role in the election of President Obama in 2008, and likely will again in 2012. What is you take on these data? When whites do blatantly racist stuff nowadays, since they control the dominant white racial framing, they get to decide what is racist and what is not. That is, when they do even racist stuff like this, they get to define racism as not racist! One has to wonder too why she thinks she really has “black friends,” with racist framing like this. This is an old set of white defenses. A sincere apology and self-searching about where such imagery comes from and why one thinks it is funny, that would seem to be the best response, not such defensiveness. Another serious aspect of this is that Republican officials, including Davenport, are quite concerned about who released the racist “joke” to the media. This seems to be a greater concern than its brutal simianizing racism and revelation about the deeper thinking of some conservative Republicans. Clearly, if such blatantly racist “joking” incidents and events are kept in the white backstage, they are not considered serious at all. It is when that sordid backstage becomes public that whites must acknowledge and back off. Davenport also claimed that she did not even know it was racist. In no way did I even consider the fact he’s half black when I sent out the email. … the thought never entered my mind until one or two other people tried to make this about race. So, racist fun in the backstage is OK and in their minds does not show us how whites with political power and influence really think negatively about black Americans, such as that they are connected to simians–a white racial framing that has been around for at least 250 years.